The Chicago Sun Times has traditionally been the newspaper of the left in town. These days it’s hard to find any rag that doesn’t shill for Obama. But The Sun Times is going out on a limb to criticize Obama. Staff reporter Dan Mihalopoulos wrote a story today about David Axelrod, Obama’s PR manager who left the White House last year to work full time on the campaign. It seems that Axelrod’s old PR firm, the one that he founded, is knee-deep in Chicago business. Of course, Mayor Rahm Emanuel was Chief of Staff at the same time Axelrod worked in the White House. Hmmm. And although Axelrod left the PR firm to work in Washington, he’s still drawing $200K a year (Does that make him a 1%-er?) from the firm and his new firm is on the same floor in the same building as the old. Did I mention that he still has an office in the old firm? Did I mention that two of the projects Axelrod’s old firm is working on are very lucrative, long-term programs – renovating Wrigley Field with public money and an infrastructure investment scheme using private funds. Axelrod says he had no role in landing those contracts and isn’t involved in the work ASGK is doing for Citibank…or for the Cubs. Axelrod says he didn’t even know Citibank was an ASGK client until a reporter told him. Axelrod says the terms of his deal with ASGK “are fixed and unaffected by these deals” with Citibank and the Cubs. Another Axelrod-founded firm — AKPD Media and Messaging — recently produced ads critical of the Chicago Teachers Union, which is embroiled in a contract dispute with Emanuel. AKPD oversaw Emanuel’s ad blitz during his mayoral campaign, and the firm is a paid consultant to his political committee, state records show. “I rent space in my old offices, but I work full-time out of Obama headquarters these days,” Axelrod says. Ald. Will Burns (4th) — who voted for the trust — works for ASGK. Its website lists him as a managing partner. Burns says he doesn’t work on the Citibank account and had been unaware that Citibank is an ASGK client. But you’ve got to trust the Chicago Machine. There’s nothing to see here. Really. Especially in an election year. A tip of the hat to Mr. Mihalopoulos for his political courage. David Axelrod — the top campaign adviser to President Barack Obama — sold his ownership stake in ASGK Public Strategies in 2009, when he became a senior White House adviser. But Axelrod didn’t cut his ties to the Chicago public relations firm completely. He still has an office there. His name is on the door. His old partners are still paying him the five annual $200,000 payments they agreed to when they bought him out. Now, two of the firm’s clients — Citibank and the Chicago Cubs — have a lot riding on decisions to be made by Mayor Rahm Emanuel, the Axelrod friend and former White House colleague who ran on a pledge to reform a City Hall he described as riddled with influence-peddling. Axelrod says he had no role in landing those contracts and isn’t involved in the work ASGK is doing for Citibank, which wants to help finance Emanuel’s highly touted Chicago Infrastructure Trust, or for the Cubs, who want Emanuel’s help in financing a major renovation of Wrigley Field. Emanuel’s top spokeswoman says hiring ASGK won’t win Citibank and the Cubs any favors from City Hall. Still, the public is rightly skeptical when companies with insider connections are involved with government, especially when the stakes are high, says David Yepsen, director of the Paul Simon Public Policy Institute at Southern Illinois University in Carbondale. Yepsen says the Cubs and any firm that wants a part of the potentially lucrative Infrastructure Trust should engage in “total transparency” about who’s helping their efforts. ASGK quietly has played a role in a number of major issues at City Hall, among them helping win City Council approval in 2008 for the Chicago Children’s Museum’s now-abandoned plan to move from Navy Pier to Grant Park. Another Axelrod-founded firm — AKPD Media and Messaging — recently produced ads critical of the Chicago Teachers Union, which is embroiled in a contract dispute with Emanuel. AKPD oversaw Emanuel’s ad blitz during his mayoral campaign, and the firm is a paid consultant to his political committee, state records show. Like ASGK, AKPD continues to pay Axelrod for selling his stake in that firm. AKPD owed him $2 million, to be paid over four years, when he became a White House aide, Axelrod told federal ethics officials. 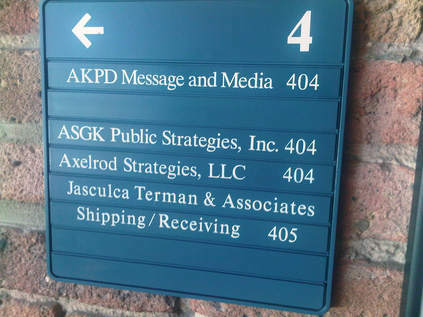 Both AKPD and ASKG are housed at the same River North address that’s also home to Axelrod Strategies, the firm he founded upon leaving the White House last year. “I rent space in my old offices, but I work full-time out of Obama headquarters these days,” Axelrod says. ASGK’s managing partner, Eric Sedler, won’t talk about the work the firm is doing for the Cubs and Citibank. Dennis Culloton, spokesman for the Cubs’ owners, won’t say what ASGK is doing for the team but says it was hired in the past year and answers to Michael Lufrano, the team’s general counsel and executive vice president of community affairs. The team needs support from Emanuel and the City Council to advance its $300 million plan to rehab Wrigley. In April, Emanuel said negotiations for a Wrigley deal were in the final stages. Then, the mayor reacted angrily to reports last month that Joe Ricketts — patriarch of the family that owns the Cubs — was part of a conservative group considering a since-dropped plan for a $10 million attack ad campaign on Obama. Emanuel has since declared that that won’t affect negotiations with the Cubs, but Hamilton says City Hall currently isn’t engaged in any Wrigley talks. “If and when they do resume, the mayor will make his decision based on what is best for taxpayers,” Hamilton says. Citibank and a fund called Citi Infrastructure Partners — which won’t talk about ASGK’s work — were two of the five financial institutions that Emanuel singled out at a March 1 news conference with former President Bill Clinton at which he announced the formation of the Chicago Infrastructure Trust. Citibank and Citi Infrastructure Partners told city officials they’re considering investing as much as $200 million apiece in the initiative, which is designed to use private dollars to pay for public works projects. A newly nominated, five-member board will screen applicants to finance Infrastructure Trust deals. With only seven aldermen dissenting, the Council quickly approved an ordinance creating the trust in April.